Those of you who follow us on Instagram may have noticed that some of the Fair Harbor crew took a trip to Tilghman Island, Maryland this weekend. Jake, Caroline, and a few of the interns were lucky enough to be able to escape the heat and head down to the Wylder Hotel on Saturday. We all woke up around 5am on Saturday morning to make the drive down so we could enjoy as much of the day as possible. When we arrived we were all a little nervous because the weather was looking cloudy and we were all pretty exhausted from the long drive. Fortunately, the day quickly took a turn for the better when the sun came out as we checked into our rooms. We all rushed to throw on our FH suits so we could head to the pool and take a look at the rest of the property. We set up a small pop-up outside of Tickler’s Crab Shack, Wylder’s all white wood seafood restaurant. With a casual vibe and delicious food by the water, it was the perfect spot to display our swimsuits. We were all lucky enough to be able to enjoy the sun in a beautiful spot and of course we mixed some play into our work. The food was incredible and for lunch we had caesar salads with crab, freshly caught oysters and refreshing drinks crafted by the incredibly friendly bartenders. Some of us got a little sunburned, but overall it was the perfect day. Cocktail and dinner hour turned out to be incredibly busy at Wylder and we had even more people stop by and take a look at our swimsuits. Keeping our trunk show base at Tickler’s, we watched the sunset the over the bay, while later enjoying another meal of local seafood. We were all so amazed by the beauty of this hidden gem in a state that many of us had never had the chance to visit before. 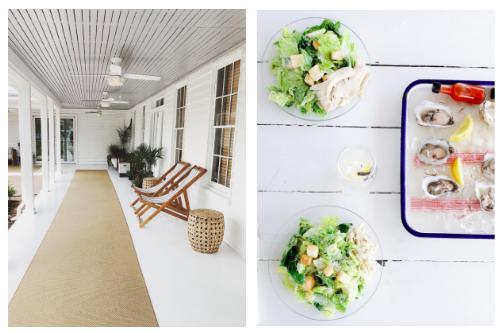 From the refreshing salt water pool, to the adorable all white wood aesthetic, and all the different activities it was the perfect place to escape for the weekend. We will definitely be back soon!